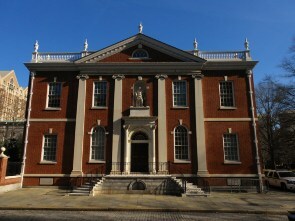 Founded by Benjamin Franklin in 1743, the American Philosophical Society continues its mission of “promoting useful knowledge” today. Originally created as a forum for American scientists (or “natural philosophers”), the Society’s members have included Louis Pasteur, Charles Darwin, Marie Curie, and Thomas Edison. Today the APS has over one thousand members from across the world representing numerous fields. Contemporary members include President Jimmy Carter, Irish poet Seamus Heaney, and Hollywood director Martin Scorsese. 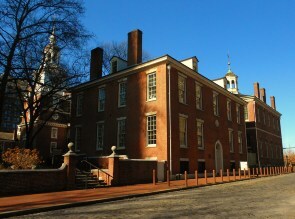 Despite its international acclaim, the APS may now be most lauded by the city for its efforts to connect to the community via its library in Independence National Historical Park, and its museum in Philosophical Hall, across the street on Independence Square. 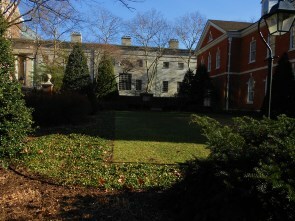 The APS Museum, founded only ten years ago, is a relatively recent addition to Philosophical Hall. The Museum organizes exhibitions that illuminate the Society’s vast historical collections for the public. In order to advance this goal, the Museum also hosts innovative public programs and contemporary artist projects that interpret these historical exhibitions. The exhibition Of Elephants & Roses: Encounters with French Natural History, 1790-1830, which was on view in 2011, is a perfect example. Artist and architect Jenny Sabin created a temporary greenhouse inspired by the exhibition’s natural history themes. The deconstructed greenhouse evoked the shape of a mastodon ribcage and was filled with various plants. The structure included a sound installation featuring music and nature soundscapes created by local composer Kyle Bartlett. The APS Museum also commissioned an original play, A Paper Garden, from actor and playwright Aaron Cromie, who brought together Empress Josephine Bonaparte and botanist André Michaux, both featured in the exhibition, to share their love of plants. Historian of science Erin McCleary created a treasure hunt, geo-caching tour that introduced participants to the “ghost gardens and lost landscapes” of Philadelphia’s past. Finally, local food writer and radio producer Lari Robling contributed a series of podcasts that explained how changes in French cuisine paralleled those of natural history. Ms. Robling enjoyed being a part of the exhibition: “The APS Museum has really creative people behind it, making it ‘the little museum that could.’ It does such unique work bridging history and contemporary art forms, and is extremely supportive of artists. My personal passion is food as art, food as culture, and food as heritage, and I was delighted for the chance to contribute to this exhibition. The Museum is truly one of Philadelphia’s hidden gems.” The podcasts, which wove together history, cuisine, and society, were well-suited for a museum with such a multidisciplinary approach. The APS works hard to educate its visitors through a variety of means, for, as founder Benjamin Franklin said, "all philosophical Experiments that let Light into the Nature of Things, tend to increase the Power of Man over Matter, and multiply the Conveniencies or Pleasures of Life."